The original Predator game is not particularly outstanding, but does a good job translating the movie into video game form. Players get to run from left to right shooting enemy soldiers while also avoiding being picked off by the Predator itself. When the time for a Predator game to be released on the MSX and NES came, however, it would be made by the masters of disastrous games, Pack-In-Video. Yes, Pack-In-Video, the makers of a great number of licensed and unlicensed video game tragedies like Back to the Future and Deep Blue, are responsible for Predator on the NES and MSX. The NES version was made for Pack-In-Video by Klon Co., Ltd., a little known developer that disappeared off the map after their first game until appearing out nowhere again as a developer of dating simulators for the 3DS in 2012. And of course that NES version of Predator was delivered to US shores via Activision, another publisher of outstanding examples of horrible licensed games on the NES like Ghostbusters, The Three Stooges, and Pack-In-Video’s own adaptation of Die Hard. IF IT BLEEDS, WE CAN DESTROY IT. You’d better. Or it will be your blood that spills in the jungle. As Major “Dutch” Schaefer, you face a deadly alien creature that skins men alive and collects human skulls-just for the thrill of the hunt. It shows no mercy. It knows no pain. And now the Predator that wasted all your men is coming after you. Awesome firepower at your fingertips. Use machine guns, greandes and laser rifles to blow through 30 stages of raw, destroy-or-be-destroyed action. It’s a bloody life-and-death struggle with the alien creature of destruction. Only one of you will make it. Ignoring the hilarity of how the film quote “If it bleeds, we can kill it” had to be changed to “destroyed” because we can’t say “kill” in products targeted at children that describe alien big game hunters skinning men alive and collecting their skulls as trophies, it seems like Activision gets it. Everything from the movie is mentioned here (along with the bizarre addition of laser rifles). So it’s clear that whoever wrote this blurb for Activision knows what an ideal Predator game would entail. Unfortunately, the game itself doesn’t even come close to working as described. The first thing one will find upon starting the game is a brief introduction describing the first half of the movie. Sounds okay, like they’re going to skip the military action entirely and go right to Arnold having to navigate the jungle followed by him avoiding, and eventually defeating, the Predator in single combat. 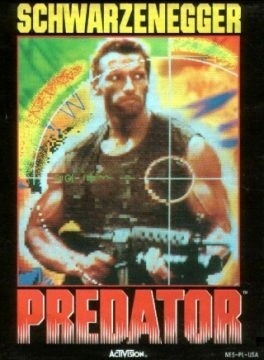 Unfortunately, Pack-In Video was only given the vaguest notion of what Predator is about instead of just basing the game on the movie. As with many games based on films from the 80s and early 90s, once you start playing it becomes obvious that this one was quickly cobbled together from whatever unfinished software they had around the office around and then had the Predator brand slapped on it. Because of this, instead of the game being about Arnold Schwarzenegger’s Major Dutch Schaefer engaging in a battle of wits and strength with the Predator itself, we have a torturous platform game where he must instead engage with jumping and running physics completely unsuited to a game world made of tiny platforms. The most challenging enemy in the game isn’t the titular Predator, but rather, the absurd level design. The levels are actually very short, but are padded out by requiring the player to take very specific paths through each one. Most hilariously, however, Dutch doesn’t even begin the game with a gun. Well actually he does, it’s right there, he’s wielding it, but instead of being able to fire it hitting the attack button only lets you punch enemies until you locate better weapons throughout each level. We also see that Pack-In Video has changed Dutch’s look, from the military fatigues seen in the MSX version to a hot pink singlet in the US NES release. You also mysteriously lose your weaponry after every level, being reduced to sliding into enemies while trying to punch them until you can find replacements. As a final insult, on rare occasion one will find an icon of a clenched fist. This “power up” removes your current weapon and reduces you to just punching things! 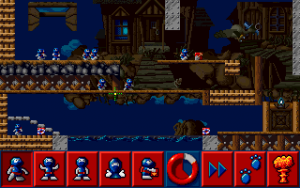 While the grenades and Dutch’s bare hands are worthless, the machinegun is of course very useful for dealing with the game’s varied enemies and obstacles. What about that vaunted laser rifle that deserved to be mentioned on the back of the game’s box? It’s the machinegun but with a more annoying sound effect. This is an absurd change from the MSX version, where you have and can switch between the weapons at will, picking up more ammunition for them from defeated enemies. On the subject of the game’s enemies, if the majority of the game taking place in a vast underground network of caves didn’t give away the game’s non-Predator origins (nothing even close to these locations appears anywhere in the film), the enemies you encounter will. 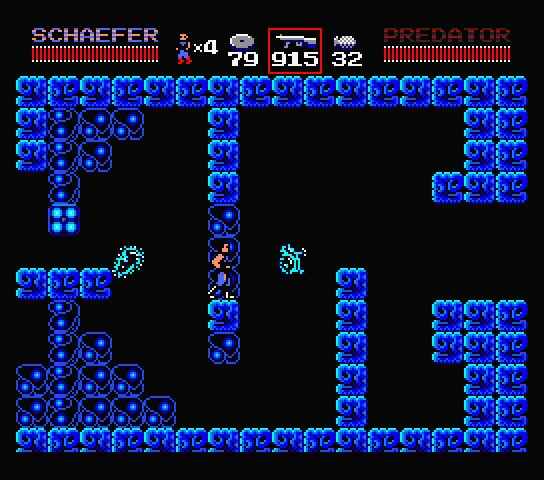 These include wide range of creatures from giant glowing scorpions, sentient rocks and slimes, giant sized paramecia, cartoony ghosts, projectile spitting plants, tiny birds that can be difficult to hit, beaked bird-like creatures that look like a more appropriate fit for a Metroid game, and human soldiers that are just small enough compared to Dutch’s sprite that it looks like you’re running around shooting a bunch of kids. Fortunately, someone at Pack-In-Video remembered what movie the game is supposed to be based on and so you do get to periodically confront the Predator itself. 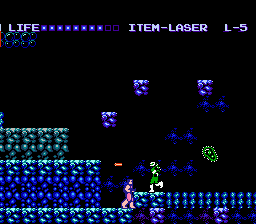 As a nice effect in the MSX version, it’s actually invisible when you first encounter it, becoming more and more opaque as you damage it more. The fights themselves are pretty bland though. It’s obvious that, like the game’s regular enemies the Predator here started out as something else, as instead of using its infamous claws or blaster, it just sort of tumbles around and tries to land on you now and then. 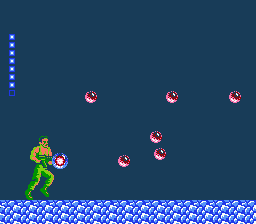 The final battle, however, has you fighting an enormous disembodied Predator head that floats around the screen shooting balls of energy out of its eyes. After that players are rewarded with a brief recap of Predator’s ending and, a Pack-In-Video trademark, no credits so that the creators of such an impressively bad game can remain anonymous. Major Schaefer soon discovers dead American soldiers hanging upside down from a tree. “I will find whomever did this!” He vows. Again, care is taken to sanitize and simplify the scene from the movie as much as possible, and again, it’s a wasted effort since this text is displayed below a graphic depiction of the skinned corpses found in the film! 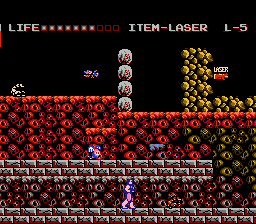 When Klon brought the game to the NES, a few changes were made from the MSX version. 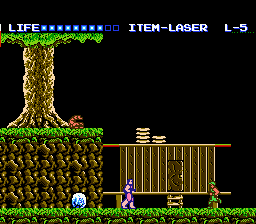 Besides removing Dutch’s weapons and changing his outfit to that pink getup, the screen now smoothly scrolls instead of the levels being displayed one screen at a time like on the MSX. This also results in much simpler level design, however, as many of the vertical areas are now truncated since they still must be accessed one screen at a time. This has the unintended effect of actually making the several of the levels more confusing to navigate, to the point where Klon added a pointing finger that appears regularly throughout these vertical areas to tell the player which way they need to go. 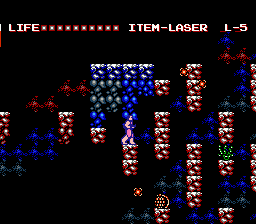 On top of that, the platforming is even more merciless, with tons of bottomless pits that in the MSX version often just had Dutch fall into a river that would take him back a few screens instead of costing him his life. The music is a noticeable improvement over the MSX release however, and the Predator now tries to tumble into the player’s general direction more aggressively. The most drastic, and most inexplicable alteration to the game, however, is the addition of the Big Stage. 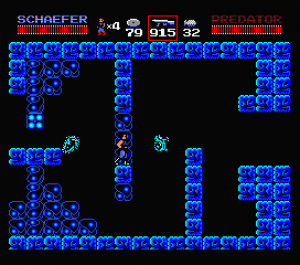 Periodically, after some painful levels of awkward platform jumping and avoiding large single cell organisms, the game will announce that you are about to enter “BIG STAGE.” These stages are where Predator really stands above the crowd as one of the dumbest games to get a major release on the NES. The idea behind the BIG STAGE is that Dutch and the Predator are portrayed with huge sprites compared to the tiny, vaguely defined ones found in the game proper. The downside is that since the sprites are huge, there’s nothing else really going on in the stages. So instead of engaging in a battle with the Predator directly, the BIG STAGE consists of a level where the screen scrolls automatically from left to right as Dutch plods along shooting at…small bubbles. 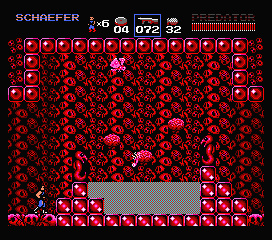 Due to each BIG STAGE having a single hideous color as its background, it can only be concluded that these levels take place in formless, garish voids of magenta, mauve and what can only be described as old broccoli rather than the caves Dutch ventures through for most of the game. So Dutch marches along shooting at small bubbles for a while, eventually running into the Predator itself, which actually looks really cool! Could it be? Did Klon actually put some decent Predator fighting action into a game titled Predator, succeeding where Pack-In-Video failed? They definitely did not. While superficially good looking, the BIG STAGE portrayal of Predator is barely animated, though to Klon’s credit it actually uses its claws and blaster. Amusingly, it also attacks by summoning disembodied Predator heads. It’s impressive that two totally different developers thought it best to portray battling the Predator via its head flying around at the player. These BIG STAGEs are awful, even more tedious than the main game, and it’s clear they were a last second addition: they actually portray Dutch in a get up that resembles what he wears in the film instead of in that pink onesie he sports in the regular NES levels. It’s also obviously rushed because the Predator can’t even turn around and barely moves, mostly sliding around and doing a single swipe animation with his claw. 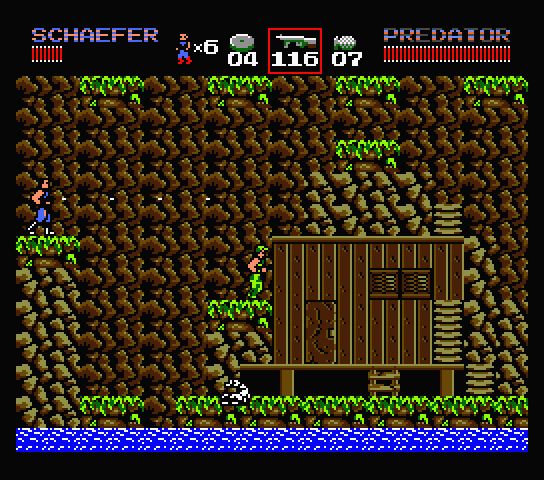 Dutch can only face right in these levels, so if the Predator gets behind him, neither can hit each other until the player moves Dutch further to the right, this makes the Predator pass off the left side of the screen and appear on the right again. Incredible. 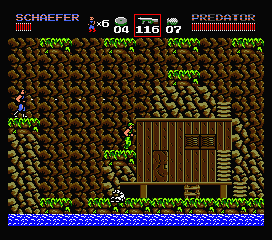 Predator is a mediocre game on the MSX, but the version Klon created for the NES is a disaster. As if realizing their failure, Klon added one last feature into the game. Players can make Dutch self-destruct at any time by pausing the game and then pressing the A or B button. Doing so costs the player one of their lives, of course, but also lets them start the level over. This is actually a great thinking on their part, since thanks to the horrible programming it’s possible to get stuck inside the terrain, making a self-inflicted explosion the superior choice to actually trying to play the game.